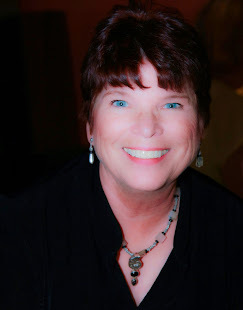 A place for my personal reflections and recording some of the highlights of my life. Here is a photo of Annika and her friend, Riley, in their Hawaiian dresses. They look so cute especially with the flower headbands!! 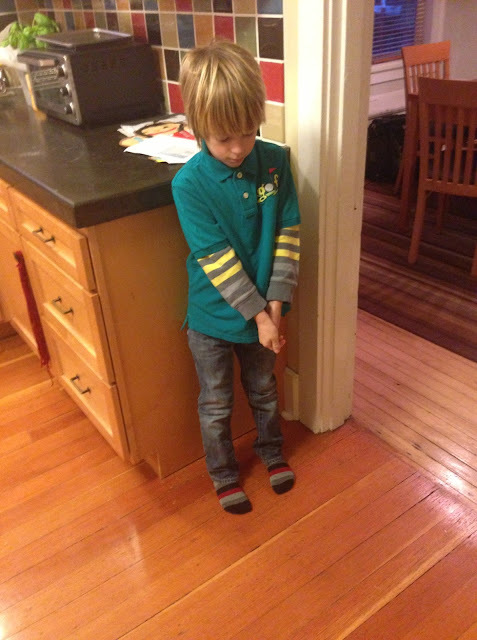 And here is Saben in his machine embroidered golf logo shirt. We are blessed to have such wonderful grandchildren! You will simply need to make sure that when you check inside the pot that there is no blockage for the end of the yarn to thread through and out the spout. This teapot is HEAVY! So it won't go flying when I tug on the yarn. I just love knitting. And crocheting. And sewing. And embroidering. And quilting. And CRAFTS of all sorts! January is usually a perfect month to focus on being creative. It's too cold to do much outdoors. The flower beds are rather dormant anyway. No pressing celebrations to tend to. Just creating items while in a relaxed state of mind. Of course, there is always the fine prospect of reading. I do love a good book....er....book on my Kindle! I admit, however, that I am more of a project person. I love the fact that when I do my handiwork, I end up with a useful item. The last book I read in December was The Zookeeper's Wife by Diane Ackerman. I enjoyed it but it wasn't nearly as well-written or as interesting as In the Garden of the Beasts: Love, Terror, and an American Family in Hitler's Berlin by Erik Larsen. Both books were based on true events and I would definitely recommend them. I am currently reading War Brides by Helen Bryan. While we were in Honolulu last month on our 2 week cruise to Hawaii and back, I bought some Hawaiian fabric to sew up some dresses for our 3 granddaughters. 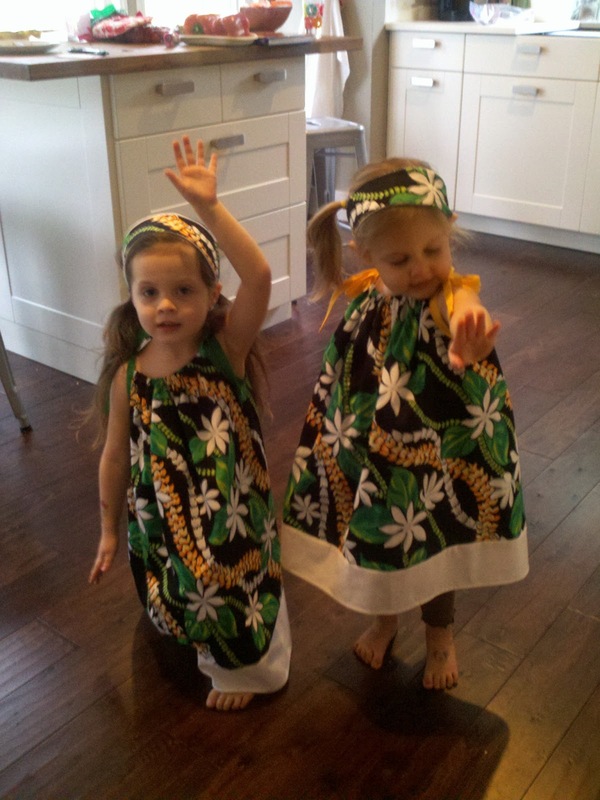 Since Maui is beckoning their families this month, I set about to sew up some simple sun dresses for the girls. Turns out I had enough fabric to make FIVE dresses! The Myrons will be traveling with another family, so I made a dress for Hailey, Charlotte and their friend Evie. I thought it would be pretty cool for all the girls to be able to dress the same. I made headbands for these three little girls as well. 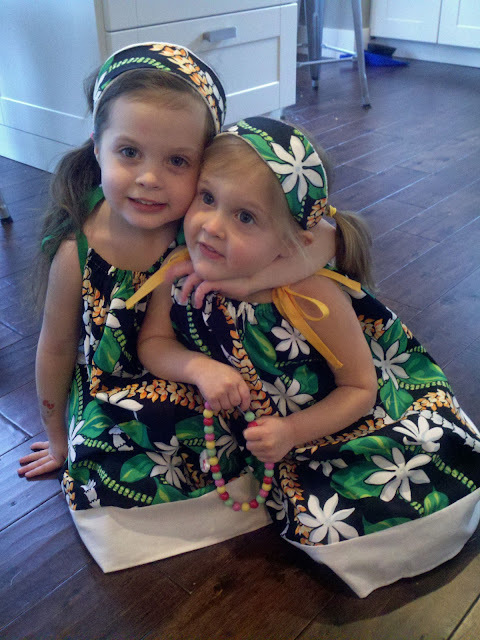 Since Kyle's family will also be heading to Maui, I made a dress with flower headband for Annika, and since they will also be travelling with friends, I sewed up an additional dress and headband for Annika's friend Riley. I got them all finished yesterday. What a fun day I had creating these! I stopped by Shauna's this afternoon and delivered 3 of the dresses. The girls were happy to try them on and pose for photos. 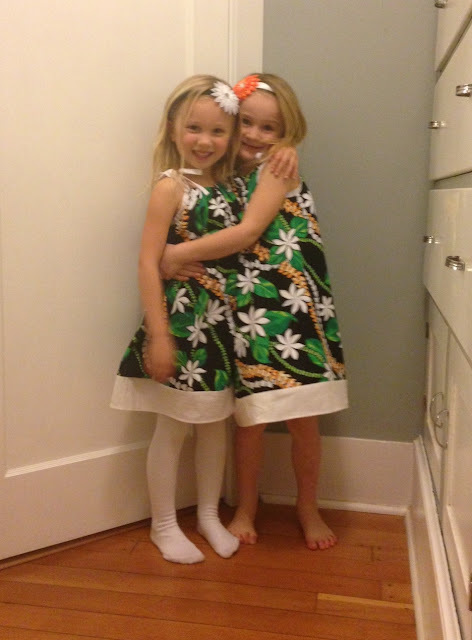 They were SOOO thankful for their dresses AND that I had even made one for Evie! They made a point to especially thank me for making one for Evie. I LOVE creating things when the kids appreciate it! I think this a dance pose! Kari, SHHHHH! Annika and Riley's dresses and a little something for Saben will be arriving as soon as I can find a box to pack them in and get them to the post office. Be sure you send me a photo of Annika in her dress and I will post it. I hope it fits! And a photo of Saben in his gift as well! I love people, my computer and creative expression. Let’s Celebrate with a FREE worksheet!